Florida Keys dolphin fishing is hugely popular. However, it's also caused a lot of controversy. That's because dolphin - the fish - has caused a lot of confusion and anger with the public because of it's name. When they hear the word, they automatically think of Flipper and are incensed at the thought of one being caught and killed. However, fishermen are not referring to our beloved "king of the sea", they're referring to the dolphinfish, aka dolphin, dorado or mahi mahi. I prefer the name mahi mahi and like much of the rest of the world, find it to be one of the tastiest of fish. Firm and flavorful, it pairs with most anything. It can be used in a variety of recipes that are full flavored and spicy tomato based. Or it can be delicately seasoned and breaded, offset with a sweet and tangy fruit salsa. 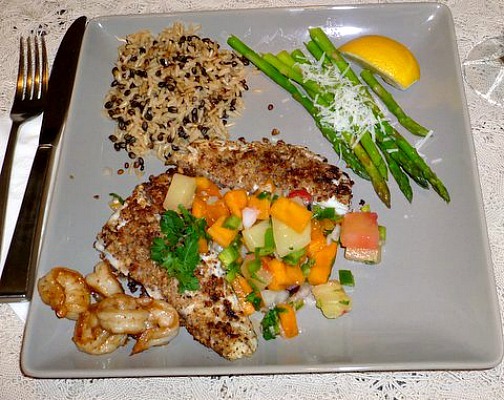 You can read my personal Roasted Pecan and Coconut Breaded Mahi Mahi with Mango and Pineapple Salsa recipe at the bottom of the page. When it comes to Florida Keys saltwater fishing, the thrill of catching mahi mahi ranks at the top of the charts. Not only because they hit hard and fight hard, but because they travel in schools. If you catch one, you're likely to catch a lot more and that's why mahi mahi fishing trips are so much fun! However, if you don't know where to go to catch mahi mahi, or you don't have the right fishing equipment, boat, or necessary knowledge, you'll miss out on all that fun, and a tasty meal. That's why so many fishermen go saltwater fishing for mahi mahi with qualified Florida Keys fishing charters. Not only do these fishing guides have the right fishing gear and boat, they possess the knowledge that's critical in finding, and then reeling in these popular fighters. 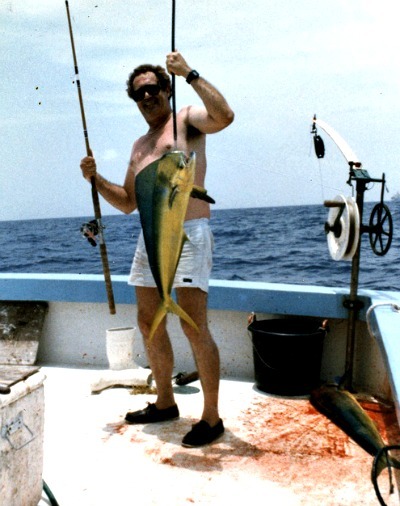 Of course when you do go Florida Keys dolphin fishing, you'll be Florida sport fishing out in the Gulf Stream at a depth of about 250 feet or more. To find the larger pelagic species, you'll go out deep sea fishing Florida Keys Gulf Stream, where dolphinfish, sailfish, marlin swordfish, and wahoo are commonly found. 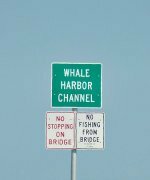 Often you'll find that by going with one of the many Florida Keys fishing charters, you'll have more fun and your fishing will be more productive. Fishing charter captains who knows the "deep blue" and where to find these feisty fish can make all the difference in how your Florida Keys fishing vacation goes. 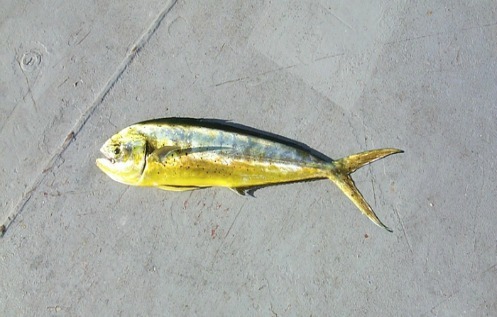 The exciting part of fishing for dorado is that they can be caught on both live bait or lure. Since they usually school, when you catch one, you'll most likely catch more. The key to Florida Keys dolphin fishing is to catch the big ones and leave the small fry for the other fisherman! Typically when fishing for mahi mahi they'll be in the 10 - 20 pound range, but if you know what you're doing, it's nothing to bring in a larger bull dorado pushing 50 pounds or more. Mahi mahi are one of the fastest growing fish capable of putting on as much as 20 pounds in a year. This is most likely due to the fact that they're insatiable eaters. They feed continually and will often congregate in schools where weed lines and debris are located. Being tremendous eaters, always in search of food gives you a major advantage. As long as you know what you're doing and what to look for, you can throw out a line with live bait, and easily entice a mahi mahi to strike. If you're wanting to sight fish and fly fish for mahi mahi, you can throw out a net of live bait. When that action causes them to surface, you can then cast your fly into the feeding mix and hook one. You can also hook live bait to your troll line and then sight fish and cast to the mahi mahi when it comes chasing after the troll line. When Florida Keys offshore fishing, an easy way to spot mahi mahi, is to watch for frigate birds circling and diving to the water's surface. The birds are after the bait fish that feed in debris filled areas. The floating ocean weed line creates a microcosm of sea life which produces a natural feeding cycle. 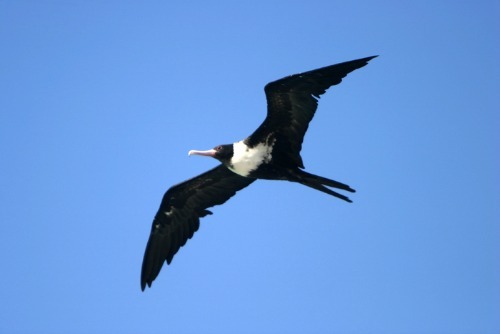 The birds are hunting the bait fish, that are in turn eating the small marine life living in the sargasso weed. The mahi mahi then come into the debris field to hunt the bait fish. It's not just sargasso weed that attracts dolphinfish. Almost any kind of debris floating in the middle of the ocean will produce fish beneath it. Always be on the lookout for debris because you'll likely encounter what you're targeting at or near the debris area. However, don't take a debris field for granted. Just because there's a potentially good looking zone doesn't mean it hasn't already been picked clean by other Florida fish. If it has, you won't have any luck. The simplest way to determine whether the debris field you've found is productive, will be to watch for the birds. As mentioned above, birds are drawn to feeding bait fish and they're your barometer for success. Frigates are an especially good indicator of what you can expect to catch. If there are a lot of birds circling and hitting the water, you likely have a larger school of smaller game fish forcing the bait fish to the surface. If you have fewer birds circling, then most likely you've got a few larger game fish driving the bait fish up. When you're Florida sport fishing, you'll find that Florida Keys dolphin fishing pairs well with targeting other great fighters of the deep such as sailfish and marlin. You'll also find that this Florida Keys fish partners perfectly in the kitchen with a variety of ingredients. Here's one of my favorites, a recipe I personally created. I hope you try this the next time you go Florida Keys dolphin fishing and bring home that tasty trophy fish! Remove any skin from the mahi mahi with a sharp knife. Wash and dry thoroughly before applying bread crumb mix. After breading, fish can be refrigerated a few hours before cooking. Half hour before you begin to cook, remove the coconut/pecan/breadcrumb encrusted fish from the fridge. When ready to cook, heat a non-stick skillet over medium - high heat with 1 - 2 tablespoons of olive oil. When hot, add fish, and turn down heat to low - medium. Cook 7 minutes, then carefully flip. Cook another 7 minutes. Test in the center of the fish at thickest point to make sure it's cooked through. If not, finish cooking a few minutes longer on both sides until ready to serve.